10.2 What are the appropriate biomembrane models for antimicrobial agents? The design and development of drugs and new pharmaceutical formulations require a full characterization of the chemical and physicochemical events occurring at the level of the single active ingredients or excipients, as well as their reciprocal interaction. Thermal analysis techniques are among the most widely used methods to achieve this; among them, the Differential Scanning Calorimetry (DSC) technique, in which the thermotropic behaviour of a single substance or mixtures is analyzed as a function of a controlled temperature program. DSC is an accurate and rapid thermo-analytical technique, widely used by the pharmaceutical industry and in drug research to investigate several physico-chemical phenomena, such as polymorphism, melting and crystallization, purity, and drug-excipient interaction; as well as characterizing biomolecules such as genetic material. Drug-biomembrane interaction studies is written by scientists renowned for their work in the field of DSC applications to drug development and delivery, and especially to drug-biomembrane interaction studies. 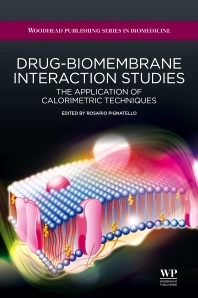 The book combines insights from biochemistry and physiology with those from structural biology, nanotechnology and biothermodynamics, to obtain a complete depiction of cell membranes and their functions. Professor Rosario Pignatello is Professor of Pharmaceutical Technology and Legislation at the University of Catania, Italy, where he works at the Department of Drug Sciences. Professor Pignatello is author of 120 scientific publications in peer-reviewed journals and about 130 oral and poster communications to international symposia. His research activity in the area of innovative pharmaceutical technology in particular focuses on: preparation, physico-chemical characterization and nanoparticles including modified drug delivery systems; synthesis, characterization and biological evaluation and QSAR studies on lipophilic prodrugs and conjugates.